I’ve been receiving a lot of feedback and questions on my “How to Signup For honto” guide so I thought I’d make another guide on something that is extremely helpful to those who use honto frequently, and/or would like to get some free points to spend on honto. 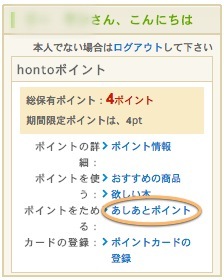 I’m not sure how many of you have discovered, but aside from the points you can get from purchasing things from honto, you could also get free points from something called あしあし (Ashi Ashi). It’s very simple. You just follow the same process, click on a button every day and you can get a point a day. If you reach 10 consecutive days, you get 10 additional bonus points. 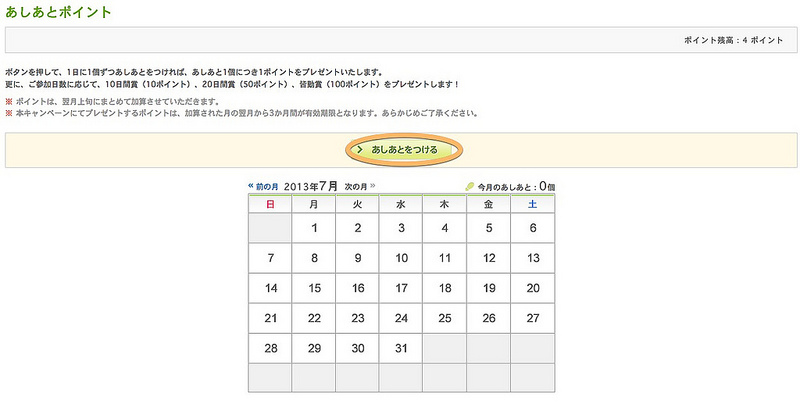 20 consecutive days, 50 additional bonus points, and if you fill up the whole calendar, you get 100 bonus points. 1 point = 1 yen. Pretty nifty, huh? So here’s how you do it. Then on the left hand side, click on “あしあしポイント” as shown below. Click on the orange circled button and the page will refresh. You will get a point, a footprint on the calendar for the day that you pressed the button. That’s it! The points will add up (to your points balance) within 10 days of the following month. The points will be valid for 3 months from the month that you had received them. As usual, if you have any questions or feedback, feel free to leave comments and I’ll get back to you as soon as possible. This entry was posted in Uncategorized and tagged anime, ashiashi, footprint, free points, honto, light novels, manga, ordering, points. Bookmark the permalink. Thanks for your helpful reply :) So it’ll be okay just using the 16 digits without keying in the CVS into the credit card information page? Yes. I’ve just entered 16 digits without a problem. If you enter more than 16 digits, it will error, telling you to enter only 16 digits (also tested). Visa debit should be completely fine. I don’t think you need your CVS in the credit card # portion. They may ask you to input the CVS during checkout, but if they didn’t ask, then it should be fine. Don’t worry! And thanks for replying mihisachi ;). Thanks, Kaizora! I feel much more relieved having heard that you tried entering more than 16 digits and that it’ll complain if you do so. I was thinking of doing that too. Haha, I’m glad I was of help, sueharu :). The only possible error I can think of related to points is that they only allow use of 50 or more points; nothing less.